This blog presents key highlights of the new functionalities of SAP S/4 HANA Cloud release 1708 and business cases that can realized for 2 Tier ERP. Let us delve into the features and functions realizable in 2 Tier deployment. 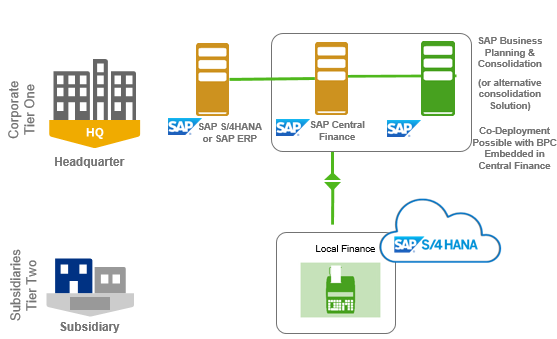 Hence for the complex system landscapes like 2 Tier, SAP S/4HANA can be deployed in Tier One as a Central Finance System which holds all financial documents of the entire group and will be a starting point for the centralized financial consolidation. Tier One has SAP S/4HANA On Premise deployed as a Central Finance System. All financial documents from other SAP and non-SAP systems are replicated to the SAP S/4HANA Central Finance system including the financial documents from a SAP S/4HANA cloud system representing a Tier Two system. SAP Central Finance can serve as single source system for the consolidation tool and therefore reduce the number of interfaces feeding the consolidation tool. Alternatively, SAP BPC can also be deployed within the SAP Central Finance system and therefore serve as a real-time consolidation solution integrated in the Central Finance system with real-time access to all master and transactional data. SAP S/4HANA Cloud subsidiary provides integration capabilities with the SAP S/4HANA Central Finance to Consolidate financial and management reporting. SAP Cloud Platform Cloud Connector and SAP Landscape Transformation Replication Server are used as integration technology. Warehousing Management has become a key differentiator for modern day businesses. The concepts like centralized Warehouse Management and 3rd Party Logistics (3PL) Providers have gained popularity. It becomes imperative for ERP systems to have the capability of addressing Warehousing Management issues of organizations. The 1708 release for SAP S/4 HANA Cloud has addressed the industry’s needs concerning integration with 3rd Party Warehouse Management Systems (WMS). At present, we can integrate an organization’s Sales and Procurement processes with a 3rd Party Warehouse Management System. The complex architecture of Warehouse Management integration in a 2 Tier ERP Scenario due to the interactions of the Headquarter, Subsidiary and 3PL can be easily facilitated. For more details on Warehouse Management in 2 Tier ERP context you can refer this blog. Apart from the above features SAP has also released a number of APIs in the Sales and Procurement domain that facilitate 2 Tier ERP deployment. Some of the APIs are Read Purchase Orders, Read Sales Orders. The details of the APIs can be found in this link. Keep following our blogs for latest updates on 2 Tier ERP. Chandan Gurav alerted moderators to note that the link for whitelisted API from the last paragraph is not working.